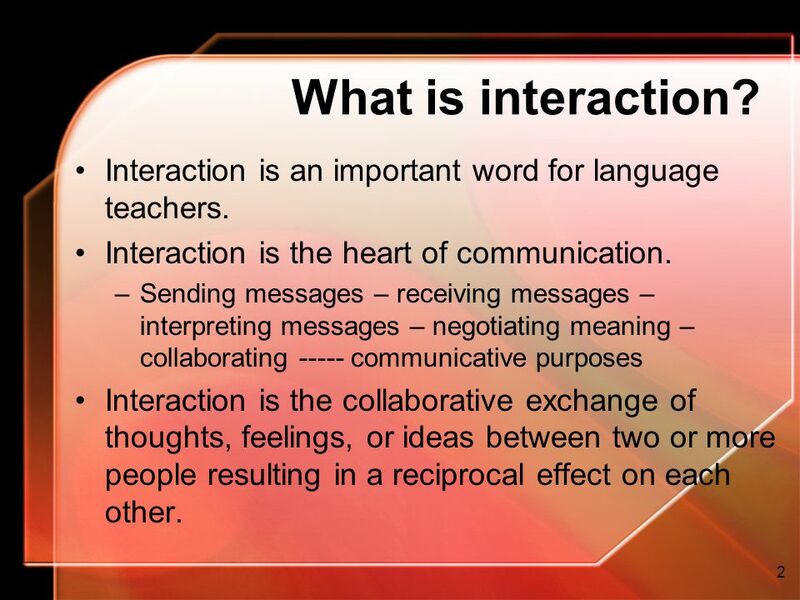 Interaction between learners is one of the characteristics of the activity based-teaching. This theme addresses how well students communicate with one another in class. Classes where students have opportunities to communicate with each other help students effectively construct their knowledge. By emphasizing the collaborative and cooperative nature of scientific work, students share responsibility for learning with each other, discuss divergent understandings, and shape the direction of the class. Within social interaction, the instruct or facilitator and student take on specific roles. The instructor must explain the concept topic and organize the groups. The process and rules of working as teams will need to be taught and reviewed to build team skills and group cohesion. During the process, the instructor must provide content focus and review. Interaction must be student to student. Students must be active and responsible for their learning, both acting as a facilitator and learner. Students will be able to explain content to one another as well as the entire class. 2. Students group into teams. 3. Students negotiate, compromise, and explain concepts to another while facilitator monitors. 4. Students assess their work. Group discussion helps develop thinking skills and social interaction. Discussions can be used as an introduction to a lesson to get students into the proper mindset or compose an entire lesson. There are two types of discussion, whole-class and small-group . Whole-class discussion, is when the entire class is involved in a discussion on a particular topic. Instructors generally lead the discussion, but students can lead student-centered discussions in some cases. The instructor has to keep the group focused, not drift too far from the topic, and keep the discussion going in an organized and steady fashion. 5-and keep things interesting and light to avoid conflicts. Student responsibilities include: knowledge of the topic, respect others' opinions, and think about their own opinions. IT is a cooperative learning method in which students work in self-made groups of two to six and are given a specific topic within the lesson that the class is learning. By using group discussion and planning, the group creates a project that they present to the entire class regarding what they discovered about their chosen topic. Cooperative scripting is another method in which students take turns summarizing sections of class material to one another until all of the material is covered. One example of this method is the think-pair-share strategy. Think-pair-share is a discussion teaching strategy that involves three stages of student interaction. Think-pair-share is a structured timed discussion helping eliminating off task thinking and behavior. Students’ intellectual and social skills are developed when using these activities, by listening carefully, sharing, summarizing, and asking question. Some examples of group projects are study groups where student review content to prepare for exams, shop or peer helpers where older students teach young students, panels and debate teams where students research a controversial issue and choose a pro/con side to defend against another group, or role playing, simulation, and game teams where student play games on content that had been taught resulting in a certificate or prize to the winning group. These models are student centered so they engage a higher level of thinking. Because the method is student centered it promotes meaningful learning. It can be beneficial to students that work well in a cooperative setting, and can be used to promote leadership, team work and problem solving skills. This strategy is most beneficial to students that work well in a cooperative environment rather than a competitive one. Some students are able to learn more efficiently and be more motivated when working together with their peers rather than by themselves. Because students work together in groups they learn to use leadership as well as problem solving skills. 1-The instructor interacts with the learners, the content , the method of teaching , the technology used and the teaching aids. 2- The learner interacts first with himself as a self talk, with the peer, the pair and the group as a dialoguing with others, the content , the technology used, the environmental realia as a practical learning and with his daily life as an independent learning. What is an interactive teaching? What is an interactive learning? Interactive Learning is a pedagogical approach that incorporates social networking and urban computing into course design and delivery. Interactive Learning has evolved out of the hyper-growth in the use of digital technology and virtual communication, particularly by students. What is an interactive learning activity? Interactive Teaching and Learning Activities. (also called “Student Engagement Techniques”) The following activities provide opportunities for students to engage with content in the classroom. What is an interactive lesson? What is an interactive class? What is interactive teaching strategy? You must engage participants in learning activities that lead to a higher level of understanding and result in the participants ability to apply what he learned on the job. • Interactive teaching is a two-way process of active participant engagement with each other, the facilitator, and the content. What is an Interactive Questions. Interactive question help you achieve a higher response rate and get more accurate replies. What is an interactive image? Interactive images are a visual and interactive alternative to check boxes, with responses given by clicking directly on the image. What is a Pear Deck? It is an interactive presentation tool trhat is used to actively engage students in individual and social learning. Teachers create presentations using their Google Drive account. 3-Talented / Gifted and Slow Learners. 4-A Learning and Teaching Environment. 5-Creativity in English language teaching. 6-The role of the Good teacher, Bad Teacher and Headteacher.